With Domino's, you can order online to get hot and fresh pizzas delivered to your door in not more than 30 minutes. 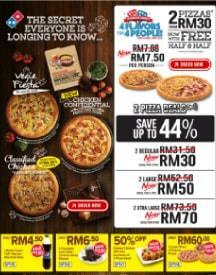 Treat your friends and family to delicious pizzas. Domino's delivers pizzas across various cities including Hyderabad, Mumbai, Bangalore, Chennai, Kolkata, Delhi-NCR, Gurgaon, Noida, Faridabad, Pune, Ahmedabad, Chandigarh, Jaipur, Indore and more. It also gives various discounts and deals to its customers. 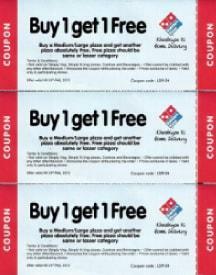 And if you are lucky enough you can even get one pizza free on buying one, also avail wednesday offer, friday offer. Don't forget to use the offers present on this page and save on your orders. Have you heard about the Dominos Friday Offer? Yes, on the last working day of the week, when you are in no mood to work, the Dominos buy 1 get 1 offer is going to make your day. It would be a perfect start to the much awaited weekend. Lunch is fun at work when the whole team gets together and catches up on the plans for the weekend or de-stress over the long week that they have just got through. Not only at work, but you can enjoy a Dominos bogo offer pizza at home too. Weekends would mean late night movies and night outs. 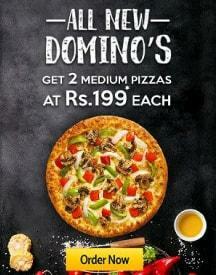 So, make the best of the Dominos weekend offer and relax with your friends and family. Got other plans for the weekend, so want to look at something mid-week? Then you must indulge in the Dominos Wednesday offer and get discounts on pizzas online. 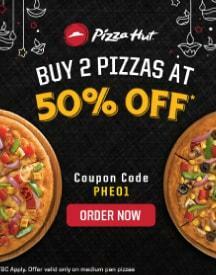 Wednesday pizza offer means that you can get 25% off on Rupees 350 or Rupees 100 off on Rupees 400. Now, isn’t that interesting? You must also make the best of the other offers such as Flat 15% off on Kids Birthday Party. Every kid wants to celebrate. Then why not take the kid and his / her friends to their favorite place or for their favorite food? Other offers on Pizzas include the 20% cash back on using pockets. You can also get Exotic Italian Pizzas at Rupees 350. 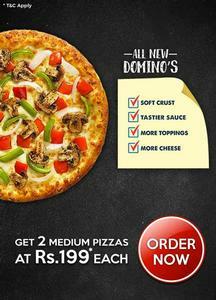 Don't miss this Dominos today offer.